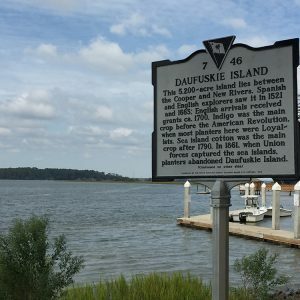 The cotton trade spurred the growth of the slave population on Daufuskie Island from 1805-1842, and ruins of slave houses and archaeological sites remain from this period. The island was largely abandoned during the Civil War but many former slaves returned during Reconstruction, reoccupying slave houses and building churches, schools, and meeting places. In the early 20th century, the population swelled to almost 1000, with oysters, logging, and trucking providing jobs. By the 1940s and 1950s, outside competition had caused many to leave the island and search for jobs elsewhere, leaving the population in 1980 at fewer than 75 people.